Bursky Locksmith Braintree, MA provides an assortment of products and services. We specialize in Home, Commercial, Auto and Emergency Services, just to name a few. If you have an issue with a lock or key, you can be confident that a call in our direction will send a solution in yours. With your help, we aim to be the go-to lock and key specialist in your area. Our Braintree locksmiths response time to emergency and non-emergency calls is fast and efficient. We maintain an average time of 15-20 minutes! Now you don’t have to set aside an entire afternoon just to wait for a locksmith to show up. You can confidently give us a call and know that we will help you shorten that “to-do” list, not delay it. We have no doubt that we will have you lock or key issue resolved in an instant and have you on your way in no time. 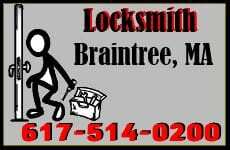 Bursky Locksmith in Braintree, MA is here to help you with your lock and key needs whenever they arise. Our dependable 24/7 service is fast and efficient. Our experts make short work of any task. With years of experience under their belts, our technicians are quickly giving our new company the reputation it deserves. Bursky Locksmith boasts some of the most excellent prices in town. We are always looking for new ways to lower prices or give you great discounts. Today, we are offering a 10% discount to any client that books a job. All you have to do is call us and request any service, and you will receive an instant coupon for 10% off our already low prices! For any of your lock and key issues, you can reach one of our helpful and friendly dispatchers anytime, day or night. Simply call 617-514-0200 and we will take down your information and location to find you our nearest technician. Our skilled locksmiths are always on-call, ready to help you with any lock and key issue that you may be having. Whether you’ve locked your key in your car or in your home, our experts will get you back in quickly and without causing unnecessary damage.